My favorite time to run in the spring is at dawn. Nothing is better. Watching the sun rise and enjoying the cool air is refreshing and invigorating. After being injured for several months, I am slowly getting back into shape and am looking forward to those early morning runs with friends. Spending time with fellow runners while catching up and enjoying each other’s company keeps us motivated and connected. My goal this summer is to slowly add mileage to my running. I am also going to do some trail running to get ready for Rick’s Run; I hope to run more than one lap this year! 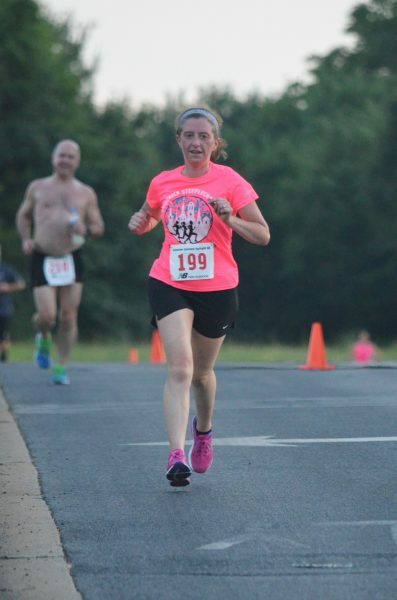 Spend some time making summer goals for yourself, and don’t forget all of the amazing running and social events coming up this summer for our members! June 6th, the 2018 decathlon began! Over 30 Steeplechasers came out to Linganore High School to compete in the two-mile race. It was a great success. We had perfect weather. 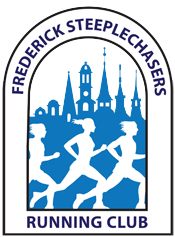 If you are interested in joining the decathlon events, we will be meeting at Linganore High School through June 20th, then, hopefully, back at Frederick High. Thanks to Tim O’Keefe for leading the decathlon for over 25 years! Finally, we will end our summer with our annual picnic on August 25th. Thanks to Heidi Novak for planning this fun event. We will celebrate the success of our decathlon and enjoy food and drinks as a running community. I hope to see many of you there. This summer is definitely a busy one! Enjoy yourselves, run with friends, and take care.